play ball against a team in baby blue. a basket, a maneuver, good sportsmanship. Way to go! That’s my boy! and Good job! Is this an inherited dearth? he is here to yell something. we’d been able to say to his dad. The very least that we could do. Stephanie Noble is almost every kind of mother: birth mom, adoptive mom, step mom, mom-in-law, and grand-mom. She has found these distinctions dissolve in the buoyant sea of maternal love. She has been married for 48 years to the artist Will Noble. They have four children and five grandchildren. Her poems have been published in a number of journals and anthologies including the Atlanta Review, Buddhist Poetry Review, and California Quarterly. She was a 2014 Pushcart Prize nominee. 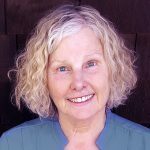 Stephanie teaches insight meditation in San Rafael, California, and is the author of Tapping the Wisdom Within, A Guide to Joyous Living. Visit stephanienoble.com.